President Peter Litchfield with Len Taylor Triples winners on Sunday - Peter Winn, Matt Leaver and Martin Winn from Oakfield. 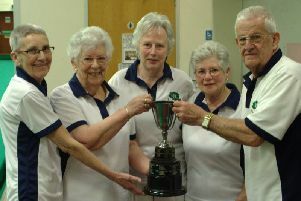 On Sunday the Rugby Bowls Association held their traditional yearly competition, The Len Taylor 2 Wood Triples, which was supported by 22 teams from the Rugby area, playing at two venues, Bilton BC and Oakfield BC. Commencing in the morning with a gala type draw, there were four rounds of eight ends played to decide the four highest scoring teams from each venue who would then meet at the Grange BC in the afternoon to contest a knock out ten-end competition. In the quarter final C Carter (Rugby) beat R Thorneycroft (Caldecott Park) 9 shots to 7 shots, P Yoeman beat T Fuller (both LMRCA) 10-6, K Mason (Rugby) beat B Lambert (Thornfield) 6-4 and P Winn (Oakfield) beat T Wells (Rugby) 13-4. In the semis P Winn beat C Carter 15-4 and K Mason beat P Yoeman 9-6. The final proved to be an enjoyable match to watch as in the early stages, the Rugby trio eased into an early lead. This didn’t put the Oakfield trio off, quite the contrary as some fine bowling took them to a winning score of 11 shots to 6 shots after 10 ends. RBA President, Peter Litchfield presented the prizes to the winners, runners up and the two losing semi-finalists.